We begin this month's review looking at rail traffic. Rail traffic in general continues to improve over 2009 levels. Because there are some seasonal issues going on around this time, I don't want to over-hype the small draw down that we are seeing here. Seasonally adjusted we are only down around 1.3% in total tonnage from last month. Having said that, every report I read is simply talking up how great the shipping tonnage rates are. In an attempt to examine this, we can simply note that tonnage compared to 2009 is about 20% greater yet it is still around 10% lower than 2008. In addition, we need to keep in mind that the best years on record for intermodal rail shipping were 2006 and 2007 so it is a bit more sobering to think that we are recovering, but not near peak levels. GDP adjustments really reinforce this as last weeks revisions to GDP showed that growth in GDP was slowing well before 2008. Motor Vehicle rail cargo and waste and scrap metal materials shipping is tailing down in recent months. The autos shipping and sales data is absolutely seasonal so I don't want to highlight that much given that it may mean nothing, however the drop in scrap metal and waste movement is something to keep an eye on as these are inputs into the manufacturing process. Later we'll look at scrap metal pricing. As I mentioned last month KSU and KSU Mexico continue their slide in tonnage. I put this up because we need to continue watching these rails and their cargo shipping. Specifically for them, they are encountering a crossover from levels from last year in this quarter and this may be a concerning development to monitor. Last month I mentioned CNI and showed their chart as the best performer. I also suggested passing on their stock simply to wait for a retest below support. That didn't work out well as the stock is now trading almost $6.00 or 11% higher. (I wouldn't chase it here). I wanted to include some data related to jobs. Below is the information for the Monster.com Employment Index. This data shows a summary of online recruiting efforts and job availability. This data highlights information from June, but I will begin updating it monthly in my chart form. In that time period, Monster suggests that in 13 of the 20 major employment areas in the country, there were additional listings on job boards and company websites. The biggest gains were made in hospitality and food services industries. Examining the most recent unemployment report confirms these trends are continuing as well. ECRI continues to release data showing that the weekly leading indicators are falling. Last week's -10.7% growth rate provides ammo to those that are arguing that we are headed for slow down, if not another recession. 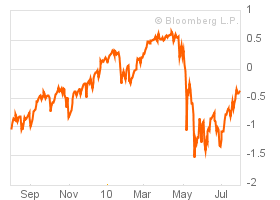 Again, the slowing data here is in contradiction to the ever-ramping stock market. Housing drops and consumers reducing their purchases is driving the drop in growth rates. 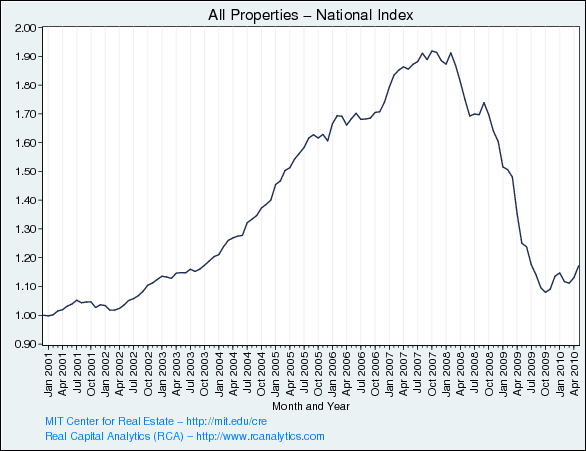 The most recent Moody's / MIT Commercial Price Index Data shows that commercial real estate prices in the index increased 3.6% for the month of May. Again, this data is lagging here, and isn't showing that pricing has leveled off yet. Equity market gains and other financial market rebounds have fueled the recovery in the Bloomberg Financial Conditions Index. A level above 0 would indicate that the recession is over, numbers below show a contraction. We have not pushed through zero yet, but a significant equity market explosion higher in August could at least give us a second attempt at moving into an expansionary number. SCRAP METAL - GOOD TIME AL'S FAVORITE INDICATOR - Alan Greenspan often said that he watched the price of scrap metal to determine the health of the economy. Below is a scrap metal chart for the last two years. Just like every 2 year chart it shows the same shape moving up and to the right, but it is interesting to point out that this index bottomed out in January of 2009. This would have been a good indicator to use to portend the market's recovery in 2009. We see that we've endured a drop in scrap pricing in late June and July, only to see a move up in the last week or so. The USD's dramatic decline seems to have washed away all fear of European collapse or should I say the lack of fear of the European collapse has begun to wash away the value of the dollar! Those stress tests sure did the trick didn't they? The decline of the dollar has certainly also ushered in a revival of the stock markets. 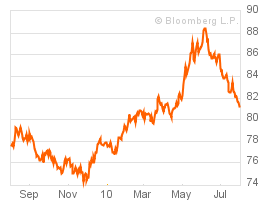 Funny, we are now hearing that folks are concerned about the downward direction of the dollar. The truth is simply this in my opinion. We will have little upward momentum in the markets without a destruction of the value of the dollar. Having said that, Alan Greenspan this weekend put into words what the FED is really thinking. Greenspan simply stated that the market is the economy! So, we must be on alert that since the "Economy is the Market" we are being reminded that asset values are the only concern of the Fed and the only hope to return things back to the good old days. Understanding this means we remind ourselves that they seek a return to inflation, easy money and credit, and if it takes it, a decline in the purchasing power of the dollar. Here me loud and clear. There may be ups and downs in the value of the dollar, but if the FED has anything to do with it, there will be an ultimate walking down of the value of the currency. This is the only way to survive and extend with the looming debt issues we have. 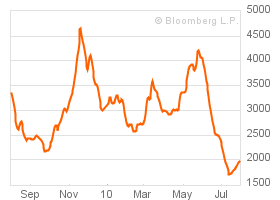 The BDI has made a significant drop since May and June and is attempting a bottom here. As commodity demand increases we should see a move higher in the cost of spot shipping, however the drop in the BDI is a reflection of the over supply of ships that stand ready to carry freight. Still, if you are an owner of those ships that don't have long term contracts at a fixed price, you are probably hurting very badly at these rates. I like the simple chart provided by the guys at Growthstock Advantage. Based on their indicator that examines the number of stocks trading above their 40 day moving average, the market is NOT overbought yet. As stocks get extended it is sometimes helpful to see when everyone loves the market. Typically you might consider scaling out of positions or shorting at that time. At this point the indicator is NEUTRAL. COPPOCK TURN INDICATOR - I showed this chart last month and it is simply a 14 month moving average of the Dow. When the average turns and heads south like it did last month at the end of July, it is an indicator that the market may be headed the other direction. The COPPOCK is one of those indicators that confirms a move rather than one that is predictive. Having said that, even with July's monstrous performance, the COPPOCK is suggesting that we are still going to go lower and therefore it is BEARISH. 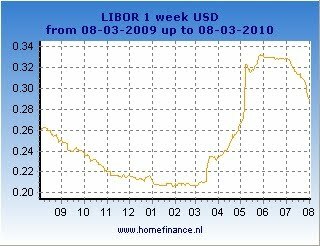 US Libor continues to improve and so do all other denominated Libor measures. I made a comment right after the European financial stress test result release that I'd be watching these levels to get a confirmation that the banks actually were believing what was being served up. Because we are seeing a drop in these rates we can confirm that stress is abating. So while the contraction in rates is only a few basis points since last week, it is a 10% reduction in 1 week funding rates, which is significant. As the flood of disappointing news rolls in about a slowing economy, St. Louis Fed President James Bullard moved from his centrist position to one of outright advocacy for the spawning of the Son of Stimulus just like we've been warning for at least a month. Bullard's discussion warned of the specter of a Japanese style deflation, exactly what they want to avoid at all costs. Bullard's comments make it all the more likely that the Fed will actually move to invoke more stimulus in the form of buying treasuries, buying more agency backed mortgages, and maintaining a near zero rate (no hikes). Bullard's comments probably are part of an orchestrated effort to convey the Fed's future policy. We cannot forget that no matter how ineffective Fed policies have been in creating a real recovery in the economy, this is really about creating a rebound in market or asset values. Like we've stated above, Good Time Al believes the market IS the economy. Check back to the post we made last year regarding Bernanke's 2002 deflation speech. There is no ambiguity there. He is positively stating that the Fed can and must win against the deflation enemy. Despite the fact that jobs have not returned and the housing market is still floundering, we will see a new round of QE that looks to further juice the market. I would guess that this will have a smaller effect in terms of the magnitude of a move on the market and the impact will have less of a lasting effect in terms of time than last time, but if we get confirmation from the Fed that they will provide liquidity, we will see a move up. 30 DAY TRADING OUTLOOK- Ok, so the Fed is beating the drum that they will do anything to stop deflation and they will continue to buy treasuries, what is the play for the month? It is exactly the same strategy that I outlined on July 3rd in the Mid Year Review. We should continue to invest in emerging market issues focused in countries like Brazil, China, India, Indonesia, Malaysia, Chile, and Taiwan. All of these etfs have broken out, and even the S&P 500 extended its gains over the 1120 level I highlighted last week. While macro indicators confirm the slowing, we cannot deny the short run impact of a committed Fed. Bullard essentially has thrown down the gauntlet and stated that the Fed will use all of its ammo to fight deflation. Once again, the Fed playbook is opened and I suggest you read our post on deflation to remind yourself of the commitment to defeat that enemy at any cost. The hawkish tones of Bullard emphasize what is at stake and the intensity of the desire to prevail. While I've been bearish on gold lately expecting a pullback to the $1040 area, I am tempering this because of the expected Fed devaluation. CPI data will probably come in lower, yet this will only fuel the Fed's aggressive response.